The donors to Trump’s campaign are unlike those backing any other presidential candidate -- of either party. Trump is financing his own campaign. He’s accepting small contributions from individuals, selling hats and other merchandise online, but he is not accepting corporate gifts, he has insisted that no SuperPACS use his name, and he does not accept funding through SuperPACS. Smaller business contributions are listed here. And nobody knows the racket between corporations and politicians better than Trump. He has used the system for years. Trump has talked about his past business practice of contributing to politicians in both parties to gain access. On the other hand, he is pandering like a politician when he supports ethanol subsidies to win the Iowa caucus. The head of the nation’s biggest business lobby inveighed against presidential candidates singling out immigrants, ethnic or religious groups, highlighting divisions among supporters of the Republican establishment and the party’s leading candidate Donald Trump. When asked if the comments were specifically about Mr. Trump, Mr. Donohue said they applied to any one of the candidates from the right who “stepped over the boundary” on issues such as immigration and trade. “They lost track of who we are and what we stand for and how we fix this economy,” he said. But the remarks closely echo similar comments from South Carolina Gov. Nikki Haley and other Republicans who have pushed back against of Mr. Trump’s policy prescriptions on immigration and security. In other words, the CoC is worried that they will not be able to influence Trump. Compare that with the latest exposé on Conservative Treehouse reporting on the SuperPAC money going into anti-Trump ads (and pro-Cruz ads) in Iowa. It’s always the same: Follow the money. So far with Trump, it’s the ethanol subsidies. For background on Chris Christie’s fund-raising, posted earlier on this blogsite, go here. For background on Dr. Ben Carson’s fund-raising, posted earlier on this blogsite, go here. For background on Jeb Bush’s fund-raising, posted earlier on this blogsite, go here. For background on Marco Rubio’s fund-raising, posted earlier on this blogsite, go here. For background on Ted Cruz’z fund-raising, posted earlier on this blogsite, go here. S.B. 63, the online voter registration bill, has raised concerns that it may further threaten Ohio's voter integrity. Ohio's elections process has been under some scrutiny over the last several years due to an increase in reported voter fraud cases, specifically (SOS Post-Election Voter Fraud Report May 2013) (SOS Report December 2013 Non-U.S. Citizens Register and Vote in the Battleground State of Ohio). Franklin County reported more than ninety cases of double voting in the 2012 Presidential Election as reported in the Columbus Dispatch in June of 2013. In addition, nineteen indictments were handed down in Hamilton County. A state-wide citizens' audit of Ohio county BOE's conducted in the aftermath of the 2012 Presidential Election also indicated a number of irregularities and suspicious activity through eyewitness accounts. What is clear in these reports is that voter fraud is a growing problem in the battleground State of Ohio, and more measures need to be enacted to get out in front of the problem. Although some legislative election reform measures have been passed addressing some of the concerns, more work needs to be done. Ohio is a must-win state for the campaigns, and there are those who would seek an advantage by trying to game the system. To open online voter registration at this time would be ill-advised. There are a number of questions and concerns regarding the security of the online access and process of voter registration that S.B. 63 proposes. What the general public has learned over the last two years is that no website is secure from hackers. When the secure websites of The Pentagon, The White House and other government agencies have been hacked, then the suggestion that this website will be safe is purely conjecture and wishful thinking. The list is long of major corporate websites that assured their users their websites were secure, yet have been victimized by the hacker and information contained therein disseminated. The list of victims reported by the media is long indeed, including the industries of banking, entertainment, major retailers, and others. They have all had their websites hacked and information stolen. When it comes to the value of the voting process in our Republic, we need to proceed with extreme caution before the suggestion of online voter registration is seriously considered.This is no time for a cavalier attitude concerning the voter integrity process in Ohio. At a minimum, implementation of any such legislative proposal should be delayed until 2017, and a trial run should be conducted to assure that the security of the website can be verified before full implementation. The following groups oppose S.B. 63 in its current form. Ohio Christian Alliance is a non-partisan organization dedicated to promoting Judeo-Christian values in American government. Ohio Christian Alliance does not endorse any particular candidate or political party. OCA provides educational materials, including voter guides and scorecards. The GOP debate this evening at 9pm is hosted by Fox Business Channel. Here's the website link to watch either a live stream online or on cable. For those who subscribe to a cable provider, just type in your zipcode at the link for options. Senator Ted Cruz is running as an outsider presidential candidate, and he appeals to conservatives. He missed the SOTU speech last night because he was in New Hampshire campaigning. He referred to the SOTU as the State of Denial Address, a view probably shared by most Tea Party Patriots. A number of Ohio conservative activists already support or have endorsed his candidacy. Where do Cruz's campaign funds come from? The Federal Election Committee report (click on the candidate’s name on the linked page) shows that almost all of the $26 million that he has raised comes from individuals. But is that the end of the story? The FEC page for Jeb! Bush shows that the lion’s share of his $24 million comes from individuals. Yet we already know that Jeb! has received over $100 million from funds contributed toSuperPACS. Those funds aren't showing up on the FEC page for Jeb! Cruz is a natural fit for the group, which is unafraid to battle in Republican primaries. One of the main donors to the Club for Growth's super PAC, New York hedge funder Bob Mercer, gave $11 million to start his own super PAC backing Cruz, Keep the Promise I. The Breitbart Media Group is financially backed and funded by Hedge-fund billionaire Robert Mercer. Mercer was/is the originating financial backer for the Ted Cruz “Keep the Promise” (KtP 1, KtP2 and KtP3) Super-PACs. Mercer is also the financial backing behind Cambridge Analytica. Cambridge Analytica is the receiver of the contact information provided to Breitbart when you participate in their on-line Presidential Poll. In essence, when you participate [in] the Breitbart poll, you are sending your personal information into a data-base controlled by the proprietary interests of Robert Mercer, Cambridge Analytica. The Ted Cruz campaign then uses the data collected to fund-raise on behalf of the Campaign. There are more links in that report; just scroll down. Breitbart is an excellent resource for news, opinion, and analysis. But like most media, including alternative media, it can be influenced by major financial backers. Stop the Push for On-Line Voter Registration in Ohio! The Government Accountability and Oversight Committee plans to hold its first hearing on the proposed online voter registration system this Tuesday at 1:30 p.m. This same committee refuses to hear testimony on House Bill 189, the Ohio’s Voter Photo ID Law. It’s interesting that the predominantly Republican committee is pushing forward on legislation that does nothing to prevent fraudulent voting and may even add to the problem, but won’t consider legislation that will help reduce fraud. We need your help! Ohio’s Secretary of State, Jon Husted, wants online voting rushed through committee and passed through the legislature. Please contact the committee members on Monday and ask why they are pushing online voting in our state but refusing to push requiring photo IDs when voting. Why Does the Ohio Republican Party Fear Their Own Voters? Voters across the country are reaching record levels of frustration, mistrust, and outrage. They are tired of backroom establishment politics continually ignoring and thwarting the voice of the people. Yet today, the Ohio Republican Party (ORP) is choosing to stick a finger in the eye of the Ohio electorate. The ORP is doubling down on shady politics that is sure to further divide voters, even more so than the establishment GOP already has. In a deliberate move attempting to ensure a predetermined outcome, the Ohio Republican Party State Central Committee is voting to endorse a bottom tier candidate, Gov. John Kasich, instead of respecting the will of Ohio voters and allowing the primary process to take place. The ORP, run by State Chairman Matt Borges, a hand-picked crony of Governor John Kasich who has already been convicted of improper use of public office, this underhanded stunt should come as no surprise," stated Ralph King, State Coordinator for Tea Party Patriots. "By voting to endorse in the GOP Primary process, the ORP only reinforces the perception across the U.S. that the voice of the voters no longer matters." Instead of fearing their voters, the Republican State Central Committee should respect the primary process and act as a neutral unifier of Republican voters against the eventual Democrat nominee. Today the Ohio Republican Party shows establishment politics and political cronyism is more important than the voice of the people." 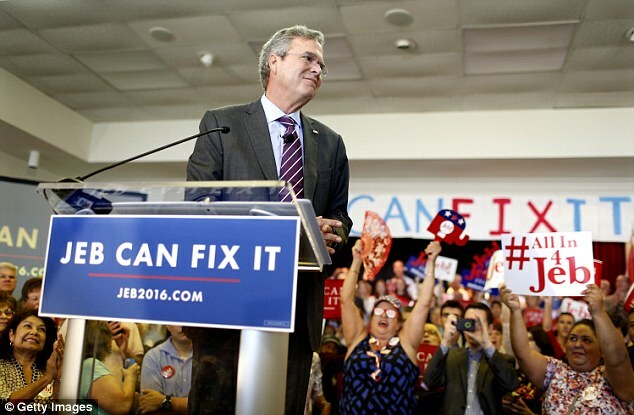 GOP campaign financing: Part 3 ~ Jeb! It is always important to remember, in 2015/2016 there are two types of funds for each candidate now: traditional campaign finance (which has rules, laws and limits – albeit changed this year), and Super-PAC funding (no limits). The campaign funding behind Jeb Bush falls primarily into the Super-PAC category, in this case, a Super-PAC called the Right to Rise Super PAC. The Super-PAC [Right To Rise] that Jeb Bush constructed, well, Jeb and Tom Donohue, and Mitch McConnell and the Wall Street power brokers who planned the entire gig, prior to the announcement of his candidacy, have a plan. At least 20 individuals each wrote checks of $1 million or more to the super PAC. They include billionaire health care investor Miguel Fernandez, the group’s biggest donor; California billionaire William Oberndorf; Iranian-American diplomat Hushang Ansary and his wife Shahla; and hedge-fund manager Louis Bacon. Right to Rise also got about 236 six-figure checks from several notable donors, including former Utah Gov. Jon Huntsman, Citadel Investment Group founder Kenneth Griffin and Houston businessman Robert McNair. With help from two former presidents and hundreds of other wealthy Wall Street and K-Street donors, the pro-Jeb Bush super PAC raised a staggering $103 million in the first six months of the year. The information at Treehouse and left-leaning Politico are consistent: Bush has the backing of Wall Street mega-financiers. The Bush campaign has been spending heavily on TV and direct mail. As of today, RealClear Politics shows Jeb is in 6th place (at 3.3%), behind Trump, Cruz, Rubio, Carson, and Christie. Up until today, a look at Dr. Ben Carson’s fundraising showed a campaign burning through lots of cash, with a campaign structure that was less than transparent. Both Politico and The Atlantic covered some of these aspects. ABC News has more – After announcing his resignation from the Ben Carson campaign, former campaign manager Barry Bennett tells ABC News that the staff changes were revealed in a scheduled call this morning. The main change Carson wanted to make was with his Communications Director Doug Watts, Bennett says. Bennett told the Republican presidential candidate on the call he would not support that decision and told Carson “it’s time for me to go.” Bennett said Carson was surprised and asked him to think about staying on as his campaign manager to which Bennett quickly told him no. One of the most influential people in Ben Carson’s political orbit has no role in his actual campaign. Armstrong Williams, 56, is a black conservative radio personality, a real estate investor, TV station owner, publisher and former political operative for figures as diverse as the late Sen. Strom Thurmond (R-S.C.) and Supreme Court Justice Clarence Thomas. Williams does not fit the traditional profile of a man-behind-the-candidate, yet he looms over the 2016 hopeful's world. In interviews with Carson, as well as top current and former campaign officials, the message is clear: Carson and Williams come as one. Williams’s forceful personality is in stark contrast to that of Carson's, who has an other-worldly calm. He has been known to step in as Carson’s enforcer when the presidential candidate would rather eschew confrontation. He has a reputation as a fixer. Oddly enough then, the cause of the resignations may relate to Williams’s support of Louis Farrakhan and the Nation of Islam, as per a blog at American Thinker titled “Support of Farrakhan organization may force Ben Carson to separate from longtime adviser".